These cargo pants are fully loaded to keep you comfortable on the job.. . . . 100% cotton ripstop. Sits slightly below the waist. FastDry(R) technology wicks away sweat for all-day comfort. Stain Breaker(TM) technology fights against stains. Comfortable gusseted crotch. Articulated knee enhances freedom of movement. Right leg side-zipper secured cargo pocket. 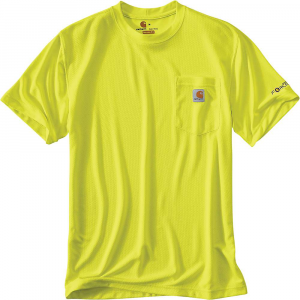 Weight: 7 oz. .
A glob of mustard, splash of grease, and a little spilled milk aren't worth a second thought when the Carhartt Men's Force Cotton Delmont Graphic T-Shirt has your back. Stain Breaker technology releases stains for a crisp and clean look every time you pull it on, and FastDry moisture wicking fabric pulls sweat away from your body for a dry and comfortable feel, no matter how hot it may be. 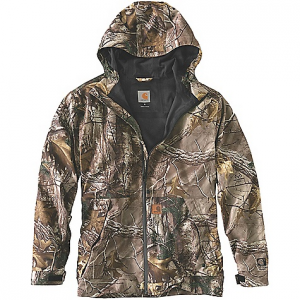 Force is latest and greatest innovation from Carhartt. This T-shirt is made from 5.75-ounce, 65% cotton/35% polyester and FastDry technology that wicks away sweat for comfort. It also releases stains with Stain Breaker technology. The raglan sleeves give you a greater range of motion. There is also Carhartt Force labeling on the left sleeve.